Age: 14-15 years old Birthday: September 30 Class: Year 2-3 Middle School Height: 159 cm (5'3") Weight: 48 kg The main female protagonist and leader of the Nega Nebulus legion, her real name is unknown. Her pseudonym is Japanese word play with Snow White. 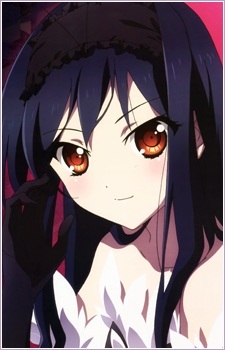 Beautiful and popular, she is also the Student Council Vice-President at Umesato Junior High School. She has been a Burst Linker since she was eight years old. Kuroyukihime was formerly the Black King, although she was driven into hiding after beheading the first Red King, Red Rider, while trying to defeat the other kings to reach level 10. She values Haru as more than a subordinate and is often the voice of reason to him when he is willing to go to extremes to protect her. Prior to her hospitalization, she confesses to Haru that she fell in love with him. Her real first name is partially revealed at the end of episode 24 when Fuuko Kurasaki calls her "Sa-chan".